DE L'ISLE - Hemisphere meridional pour voir plus distinctement les terres australes. . .
DE L'ISLE, G. - Hemisphere meridional pour voir plus distinctement les terres australes. . .
Hemisphere meridional pour voir plus distinctement les terres australes. . . - DE L'ISLE, G.
Title : Hemisphere meridional pour voir plus distinctement les terres australes. . .. Size : 17.6 x 17.9 inches. / 44.7 x 45.4 cm. 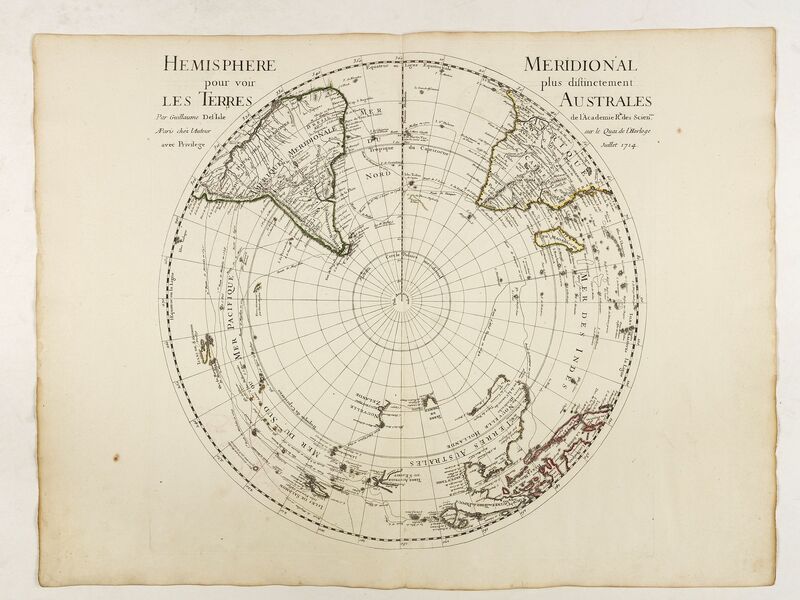 Description :Map of the South Pole showing Australia and New Zealand published by Delisle with the imprint "sur le Quai de l’Horloge, Juillet 1714". Guillaume de l'Isle's (1675-1726) well deserved reputation as one of the foremost geographers of the 18th century meant that his maps were influential for many years after his death. De l'Isle eradicated as much as possible imaginary geography in his maps. Condition : Good and dark impression.